Kofi Annan: "Climate change is not something waiting to happen"
LONDON, England (CNN) -- The first comprehensive report into the human cost of climate change warns the world is in the throes of a "silent crisis" that is killing 300,000 people each year. 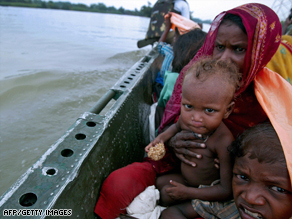 Victims of flooding in India last year are ferried to safety by the Indian Army in the northeastern state of Bihar. More than 300 million people are already seriously affected by the gradual warming of the earth and that number is set to double by 2030, the report from the Global Humanitarian Forum warns. "For the first time we are trying to get the world's attention to the fact that climate change is not something waiting to happen. It is impacting seriously the lives of many people around the world," the forum's president, former U.N. Secretary-General Kofi Annan, told CNN. Speaking to CNN's Becky Anderson in London on Friday, Annan said the migration of people from newly uninhabitable areas presents a security issue that needs to be addressed by the United Nations Security Council. "This is one of the reasons why I've described climate change as all encompassing," he told CNN. "This threat to our health, this threat to food production, this threat to security. It raises political tensions, it will have people on the move -- and they are on the move -- and many more which will bring tensions." The report, titled "Human Impact Report: Climate Change -- The Anatomy of a Silent Crisis" comes just six months before the United Nations Climate Conference in Copenhagen to forge a post-Kyoto climate agreement for 2012 and beyond. Annan called on Member States to reach a "global, effective, fair and binding" outcome on climate change, as the report warned that the talks could "well be the last chance for avoiding global catastrophe." He told CNN: "The U.S. administration has joined the mainstream about fighting climate change and that is a big step, and I hope that will also put a new momentum into the negotiations." The report's startling numbers are based on calculations by the Intergovernmental Panel on Climate Change that the Earth's atmosphere warmed by 0.74 degrees Celsius (1.33 degrees Fahrenheit) from 1906 to 2005, with much of that increase coming in recent decades. The panel predicts that by 2100 temperatures will have increased a minimum of two degrees Celsius (3.6 degrees Fahrenheit) over pre-industrial levels regardless of what's agreed in Copenhagen. "No matter what," the report concludes, "the suffering documented in this report is only the beginning." A rise of two degrees, it says, "would be catastrophic." The vast majority of deaths -- 99 percent -- are in developing countries which are estimated to have contributed less than one percent of the world's total carbon emissions. The report warns climate change threatens all eight of the Millennium Development Goals-- a set of goals agreed on by leading nations in 2000 that aim to reduce extreme poverty by 2015. The goals include eradicating hunger, reducing child mortality, and halting the spread of diseases including HIV/AIDS and malaria. Around 45 million of the 900 million people estimated to be chronically hungry are suffering due to climate change, the report says. Within 20 years that number is expected to double. At the same time food production is expected to fall, driving food prices up 20 percent. The countries considered to be most vulnerable are those in the semi-arid dry land belt that runs from the Sahara/Sahel to the Middle East and Central Asia, Sub-Saharan Africa, South and Southeast Asia, Latin America and parts of the U.S., small island states and the Arctic region. Australia is singled out as the developed country most vulnerable to the direct impacts of climate change. Over the past 15 years, the combination of rising temperature and lower rainfall has produced the worst drought in the country's recorded history. While developed countries -- including Australia -- have committed funds to counter the impact of climate change, the Global Humanitarian Forum says developing nations need a dramatic injection of funds -- up to 100 times more than is currently available to help them adapt to the changes. The total economic cost of climate change each year is thought to be $125 billion, although the Forum warns that figure may be too conservative and doesn't take into account the impacts on "health, water supply and other shocks." While commissioned by the Global Humanitarian Forum, the report was reviewed by a panel of experts, including Rajendra Pachauri of the Intergovernmental Panel on Climate Change (IPCC), Jeffrey Sachs of the Earth Institute at Columbia University and Barbara Stocking of Oxfam.